Even in teenage lungs, Dr Kumar sees black deposits that would have been almost unthinkable 30 years ago. Chronic obstructive pulmonary disease — in short, severe lung conditions — is now India’s largest cause of death after heart disease. The problem is most acute in India but it is not alone. 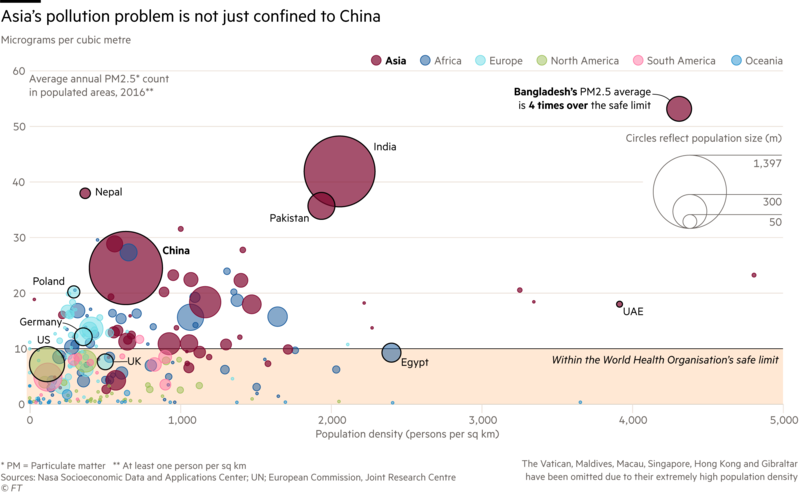 The Financial Times collated Nasa satellite data of fine particulate matter (PM2.5) — a measure of air quality — and mapped it against population density data from the European Commission to develop a global overview of the number of people affected by this type of dangerous pollution. The results are alarming: not just the number of people breathing in polluted air, but those breathing air contaminated with particulates that are multiple times over the level deemed safe — 10 micrograms of PM2.5 per cubic metre — by the World Health Organisation. The data show that more than 4.2bn people in Asia are breathing air many times dirtier than the WHO safe limit. It only takes into account areas that are populated to avoid skewing the numbers for countries such as China and Russia that have vast unpopulated regions. Historically China has grabbed most headlines for poor air quality. But as the time-lapse video of PM2.5 pollution between 1998 and 2016 shows, India is now in a far worse state than its larger neighbour ever was. 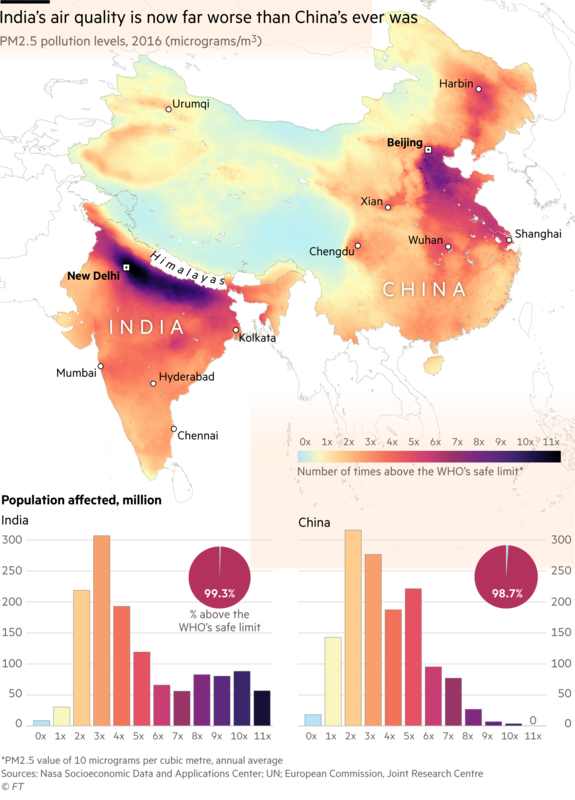 The 2016 data, the latest available, show that, although both countries have a similar number of people breathing air above the safe limit, India has far more people living in heavily polluted areas. At least 140m people in India are breathing air 10 times or more over the WHO safe limit. A study published in The Lancet has estimated that in 2017 air pollution killed 1.24m Indians — half of them younger than 70, which lowers the country’s average life expectancy by 1.7 years. 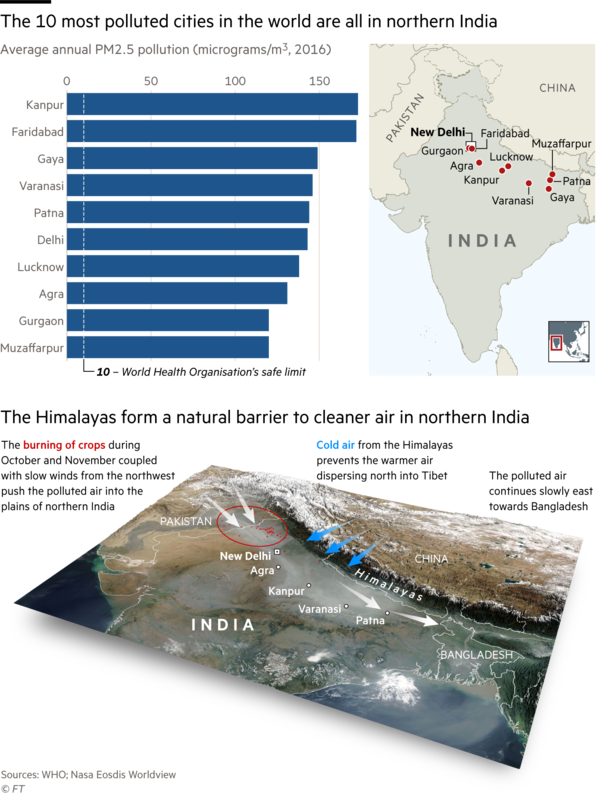 The 10 most polluted cities in the world are all in northern India. Top officials in prime minister Narendra Modi’s government have suggested New Delhi’s air is little dirtier than that in other major capitals such as London. Harsh Vardhan, India’s environment minister and a doctor, has played down the health consequences of dirty air, insisting it is mainly a concern for those with pre-existing lung conditions. But that appears to fly in the face of international studies that show that air pollution has a wide-ranging impact, including an elevated risk for heart attacks and strokes, increased risk of asthma, reduced foetal growth, stunted development of children’s lungs, and cognitive impairment. Dr Vardhan has claimed India needed its own research to determine whether dirty air is really harmful to otherwise healthy people — an argument the government also made in the Supreme Court. Dr Kumar believes New Delhi’s unwillingness to acknowledge the severity of its pollution crisis stems from its reluctance to take strong measures tackle large polluters. Such a crackdown would inevitably upset powerful vested interests in the automotive sector, highly polluting small and medium-sized industries, power plants, construction companies and farmers. And it could hit economic growth ahead of elections next year. But environmentalist Sunita Narain, director-general of New Delhi’s Centre for Science and Environment, says official attitudes have shifted since last winter’s catastrophic air emergency, when record pollution levels forced schools to close for several days. The biggest causes are vehicular pollution, industrial emissions, thermal power plants, construction dust, waste burning and millions of poor households’ use of cheap and dirty fuels such as wood and cow-dung for cooking. Then every November, this heavy mix is exacerbated by millions of farmers in the states of Punjab and Haryana burning rice stubble after their harvests, a cheap way to dispose of otherwise worthless straw. Yet Ms Narain says New Delhi has taken “very significant steps to combat pollution”, albeit often under Supreme Court pressure in the past two years. India has advanced the date for stricter fuel and emission norms to 2020, so new vehicles sold after that will be far cleaner. Mr Modi’s government has provided cooking gas cylinders to more than 50m poor households to try to reduce the use of highly polluting biomass cooking fuels, though high gas refill prices means that biomass burning remains a major pollution source. The UN climate change talks in Poland will discuss this week whether developing countries such as India should be treated differently and given more time to meet emissions targets. The Modi administration is making an ambitious push to expand renewable energy capacity, including solar power, to help meet rapidly growing power demand. Increased investment has made renewables India’s second-largest generator of electricity. 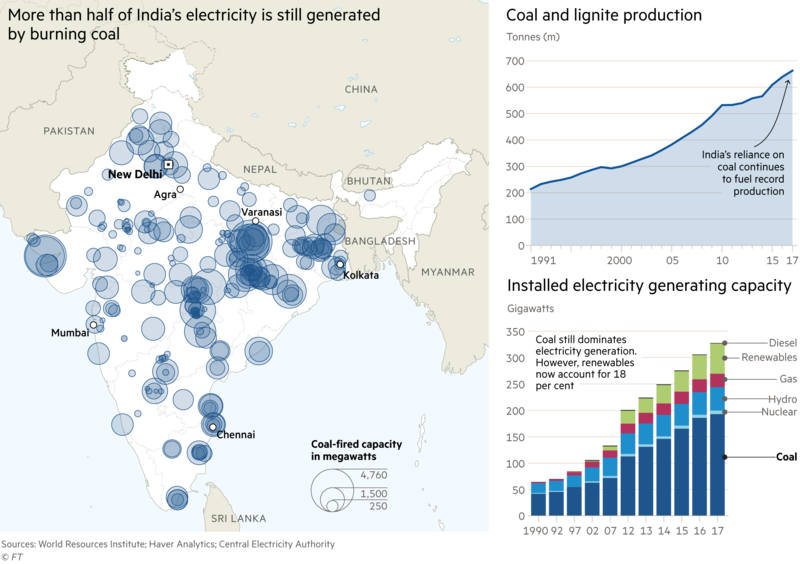 Yet India’s 246 coal-fired power plants — most of them inefficient and highly polluting — account for 60 per cent of India’s total electricity production, with a combined capacity of 188GW, and coal is likely to dominate the country’s energy mix for decades to come. While India has imposed tough emissions standards for power plants, state utilities, which own many of India’s ageing coal power plants, have failed to comply, though environmentalists are pushing to hold them to account. “The scale of pollution is so high that we will have to do things much more quickly,” Ms Narain says.